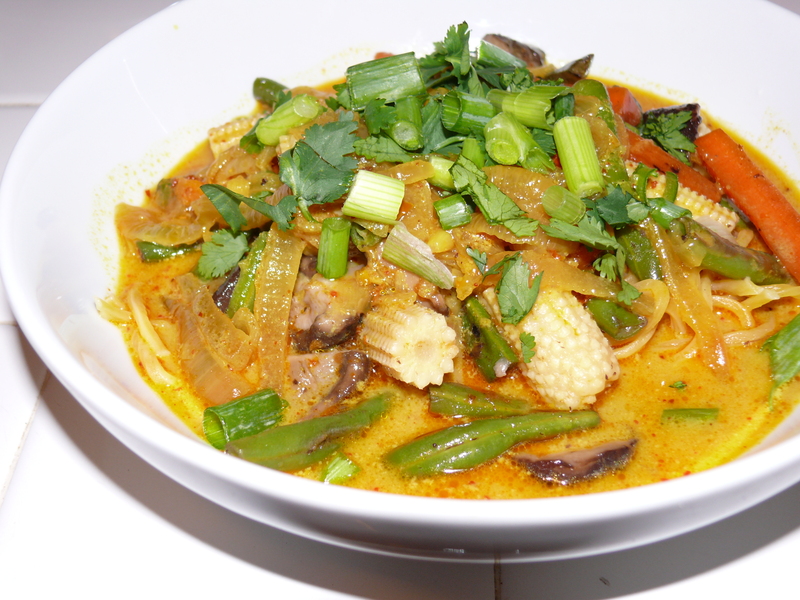 I’ve been making vegetarian Burmese curry forever and my husband always compared it to a dish his mom makes called khao soi. Then one day we had this Trader Joe’s frozen vegetarian khao soi and it was really good! I decided that I wanted to make a version a little like that one, reminiscent of star anise and using vegetables like baby corn and carrots. While googling khao soi to find some recipe ideas, I found out that khao soi is a Burmese influenced dish, but that it is common in Northern Thailand and sometimes called Chiang Mai noodles. Chiang Mai noodles sounded really familiar and sure enough, I went to my old recipe notebook and back in 2007 I printed out a recipe for khao soi! Khao soi literally means cut rice and is a dish of egg noodles topped with rich coconut curry, meat or vegetables, and garnished with things like fried noodles, fried shallots, pickled cabbage, cilantro, and green onions. It is so good. One thing I did differently is really caramelize onions, garlic and ginger for the curry based on my Burmese curry recipe that I got from Marnie Henricksson’s cookbook, Everyday Asian . It gives so much richness to the curry. Khao is super yummy with some of the noodles fried on top and fried shallots or onions, but I skipped both because it was a weeknight and didn’t want to be cooking forever. Another thing I would have loved would have been pickled cabbage, but we didn’t have any. Oh how I wish we had an Asian market close by. I could just pick up random things I find in recipes or more importantly I could pick up fresh noodles when we needed them! Instead I end up freezing the fresh noodles which only works for some noodles (others just end up gooey and gross when cooked) or getting dried. The ones I used today were dried pancit noodles which I thought worked well, but fresh and a little chewier would have been better. There are lots of different recipes online and I just took bits and pieces from each. I kept the vegetable separate instead of adding them to curry so that you can decide how much you want. In a big saute pan, heat the coconut oil and slowly cook the onions, garlic and ginger until they caramelize. Don’t rush this. Meanwhile cook your vegetables: Heat the coconut oil in a medium stock pan. Add the carrots and green beans and saute for a few minutes to brown them, then add a touch of water and cover to steam them a little and cook them faster. Then add the mushrooms and salt and cook until tender. Add the baby corn. Back to your curry, add red curry paste, curry powder, turmeric, coriander powder, chili powder, and star anise. If you really like the star anise taste, grind up one first and add it. Cook for a minute or so. Add coconut milk, water, palm sugar, and soy sauce and/or salt. Cook until the oil separates from curry (it worked for me this time! I usually can’t get the coconut milk to separate!). To serve, put noodles in a bowl, add vegetables, top with curry, fried noodles, cilantro, green onions, fried shallot and picked cabbage.